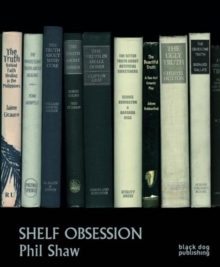 Shelf Obsession presents the work of ground-breaking British digital-printmaker Phil Shaw. His distinctive 'bookshelf' prints interrogate the changing place of the printed word in a digital age, and the transfer of meaning through inter-textuality. Intrigued by the possibility that things may not be what they appear to be, Shaw's bookshelves depict books arranged in a way that lead you to make unexpected connections and new dynamics. Shaw's work is a consistent reflection and representation of paradox, contradiction and similarity, coincidence, the enigmatic and the comic.Shelf Obsessions offers a unique view into Shaw's 45 years career, which spans over several disciplines, such as art, music and scientific research. In 2012 he was chosen by the Prime Minister, David Cameron, to create a special print to be given to the various world-leaders who attended the G8 Summit in the UK. As a result, his work is held in the Elysee Palace, The Whitehouse, Downing Street, the Kremlin, as well as numerous public institutions and museum in the UK and USA.Shaw regularly exhibits at the Royal Academy and his work is included in the Lunder Art Gallery, Colby College, Maine.